The Management Accounting Simulation: 5th Edition adds a new dimension to the teaching of basic principles of Management Accounting. Students now have an opportunity to actively practice using management accounting tools in a simulated dynamic competitive market enviroment. 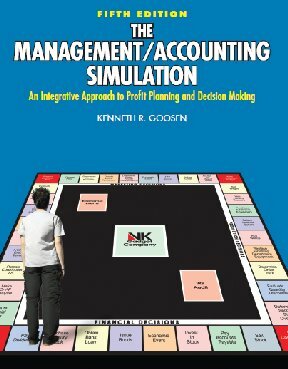 Rather than passively learn the theory underlying management accounting, students can practice using management accccounting tools such as budgeting, cost-volume-profit analysis, ratio analysis, incremental analysis, capital budgeting incremental analysis, capital budgting, and inventory EOQ. Students are assigned to teams and each team respresents the management of a specific firm. The students as management find thmemselves making marketing, production, and financial decisions. .